Paco Roncero is one of the most acclaimed chefs on the international culinary scene, with two Michelin stars to his credit for his restaurant La Terraza del Casino, forming part of the NH Collection Casino of Madrid where he is the executive chef. 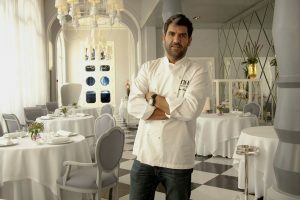 But he is also leading the gastro bars Estado Puro in Madrid, Ibiza and Shanghai; the restaurant Barbarossa by Paco Roncero, also in Shanghai; the Versión Original by Paco Roncero in Bogota; the multi-space gastronomic Sinergias in Platea Madrid and the Sublimotion, “the most advanced and innovative restaurant ever imagined”, which is located at the Hard Rock Hotel in Ibiza. The Madrilenian comes to the appointment with his arm in a sling due to a recent injury that will prevent him from competing in the Iron Man of Lanzarote, one of the most demanding Triathlon competitions on the planet. He takes his injury sportingly despite of having dedicated a lot of time to prepare himself for the test, and welcomes our questions with kindness and patience. He promises that this season will come to the island with more calm, ready to enjoy its people, its beaches and, of course, its gastronomy. Something that he could not do last year, his first season in Ibiza, for lack of time. He wishes to emphasize that these days chefs are not those old cooks who spent the whole day locked in a kitchen. They have evolved and now they are “creators of concepts” of new ideas that will move their kitchen teams, responsible for every day in the restaurants. You manage seven restaurants spread over three continents, write books, give conferences, are sworn in TV contests, give hundreds of interviews per year and you even prepare for the Iron Man, how do you do all that? The most important is to set yourself goals of doing that and then organize yourself conditions and, of course, have a good team behind you. 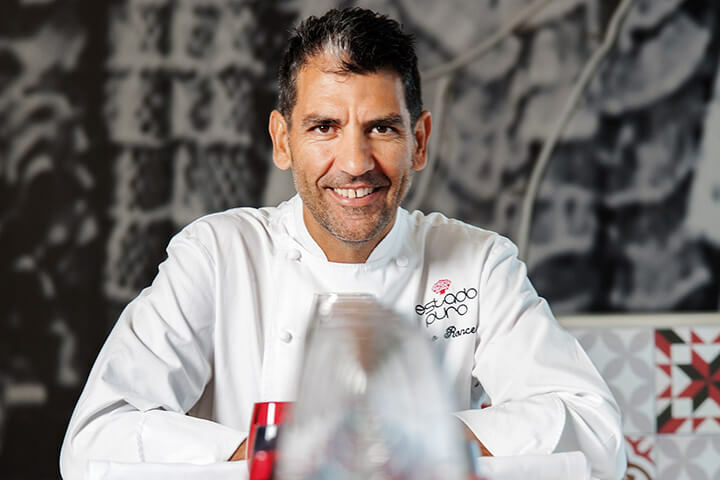 In my case, I have very good teams in all restaurants where I am and, of course, in the NH Collection Casino of Madrid, which is the basis of everything I do. I get very little sleep because I usually exercise in the mornings before going to work so I get up very early to go jogging, swimming or even cycling. With four or five hours I have enough. It is true that rest is important but also the life we lead is the one we lead and, eventually, we get used to it. Does this lifestyle have impact on your family life? Of course, it means less dedication to your family and your friends. It is like in the case of an elite athlete who trains and if he wants to meet the objectives and be the number one it is all about sacrifices and a lot to lose, so this is the same. Everything is very fast and it is clear to me that this is the way it is and this is the decision I have made in life. Anyway, I try to dedicate the maximum time I can to be with my loved ones, but sometimes traveling, working … stops me from spending as much time with them as I would want. Would you consider then that elite sport and kitchen are similar? The chef strives for excellence in every way; the elite athlete is looking to be the best. We also seek to be the best but do not compete with anyone, at least. I compete so that my restaurants were full and that people left happy. Then I try to compete with myself with the sport that is something that gives me life, that makes me feel better and so that I could work more fully. Are you, the great chefs, new ‘rock stars’? Yes it is true that it has mediated a lot. TV gives you a popularity that does not give any other medium and it is true that chefs right now are up there at the social and media level. But we have to keep our feet on the ground. Ultimately, we know to do what we know, which is cooking, creating concepts, managing our teams, making people happy and that is what we should base on. The other is welcome, of course. So that our business goes better, so that food business, in general, goes better, so that there are more people who want to be chefs, who want to serve, because what we do, in the end, is to provide a service. I think this will benefit all. Who would be the Rolling Stones of the Spanish cuisine? Oh, that would be a very large group because these days there is much, much talent in the Spanish cuisine and also many different generations. There would be a very long list of stars or many Rolling Stones, Beatles… But obviously all this would be lead by Ferran Adrià. Well, Ferran Adrià with Juan Mari Arzak, because Juan Mari was actually the person who started the new Basque cuisine with a modern kitchen and really is a bit of a father and grandfather for us all. Are you the most outstanding student of Ferran Adrià? I have worked a long time with his team and I think Ferran has many outstanding students. I was in Madrid and was the person responsible for what was his image in the Casino Madrid and the Bulli Catering. I believe that I was a good student as far as I tried to learn from him as much as possible. Is it possible to understand Paco Roncero without Ferran Adriá? I think so, but he would be a totally different person. I think I am who I am because of what I have learned while being next to Ferran Adriá. You have started, like most of the great chefs, doing ‘stages’; is it very hard to be a ‘fellow’ between stoves? If you want to learn, you have to do stages and all of us great chefs have been ‘stagers’ somewhere in the world. It is something you have to do and it is a possibility to go to the best places without having to pay for it. All the guys who come as ‘stagers’ to our restaurants and others, come happy and come with the idea that there is a great master. Is it where you really learn? You can be sure. School is important because you have a degree and it is always important to have papers, because if not, you could perfectly skip this stage. But it is true that it is at school where you learn the basics, but where you are going to be really formed will be in the kitchen. Can you give us the recipe for success? Work, work, and work. Certainly you have to have some talent, you have to have skills and attitude and be smart and have a good team to support you and be able to pull you forward and then ambition, but a healthy ambition of growing, wanting to evolve, not stepping on anyone. 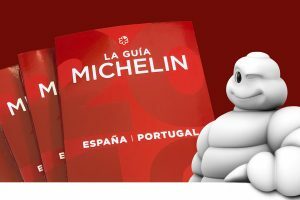 Our work is not competent, the more Michelin stars are in Madrid, the more top restaurants open… the better for us all. And here in Ibiza happens the same. The more top restaurateurs come, the more names of famous chefs come, and it is much better because people will want to come to Ibiza not only for hustle and bustle but also for the gastronomic part and when someone comes to Ibiza to enjoy the gastronomic part one day will try with us and another day with the Adrià and next day with the Arola and then with anyone else who comes. I have heard that you are a ‘creator of concepts’, is the chef no longer a cook? Many years ago they asked Robuchon, the great French chef, ‘When you are not in the kitchen who cooks?’ and he responded, ‘So the one who cooks every day, my head of kitchen’. This is the reality. Paco Roncero is in the kitchen, but Paco Roncero is not cutting the sirloin, and the ones who tell they do, they lie. What is more, that would be an absurd. We are here for quality control, so that the dish comes out perfect, so that the service is excellent, to speak with the clients. If I am speaking with the client, because the client wants to see me, I cannot be cutting the sirloin. The most important is that people know that we have great teams, great chefs behind us, who are the ones who cook every day and who are the ones who make sure everything is perfect. We are in that part of creativity to create new dishes, new concepts that make our business evolve. It has changed the way we understand a chef as such, and I say a chef as the head of kitchen maximum. It is no longer that old cook who got into the kitchen and then did not come out. It is as if you pretend that the president or director of Land Rover screws the doors. One of your best-known facets is the television; do we live a gastronomic boom driven by TV? We have spent many years on the rise, but perhaps with television programs it has grown bigger, because it is true that TV moves a lot and that people know much more. The programs like ‘Master Chef’ and ‘Top Chef’ make people know much more about food, make that children like cooking and want to become chefs… and that is very nice. These are the programs for the whole family. Will gastronomy die of success? It could happen and this is what we must take care of. It is what we should try to avoid happening to us and that is why I say that we should try to keep our feet on the ground and know who we are and, I insist that we are cooks. But I think if we are all careful, gastronomy will remain up there for many years. Has the television model implemented by Arguiñano died? Far from that. Arguiñano was the one who began to make the kitchen go into the houses and it continues. 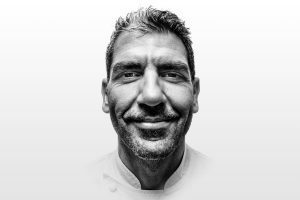 One thing is what makes that Arguiñano and other programs like ‘Top Chef’ or ‘Master Chef’ are realities and both models can coexist. How was your experience in ‘Master Chef’ in Colombia? Very nice. One of those experiences that you say, ‘Why not doing them?’. I was hesitant because I had to go to another country to do so, but the power of being with 18 guys who had no idea of cuisine, who knew how to cook the basics, to teach them, give them the opportunity to share with them was very nice. Now they are 18 new friends you have there. The truth is that for me it was very nice. In brief you start recording ‘Top Chef’. Yes and I think the fact that they are professional fulfils me much more, because I think there will be more kitchen and the possibility to share experiences with participants, with Alberto and Susi will be another one of those beautiful experiences in life that are unique. Besides, Alberto and I have lived together much in gastronomy, we studied together, we worked together, we travelled together through the world… We are good friends so we will have a good time. Have you come as a tourist to Ibiza before opening Estado Puro and Sublimotion? No, I had only been there once, but on a whirlwind tour and the truth is that I knew the island only from what people say, but I had not had the opportunity to come and enjoy it. Sublimotion is born in Paco Roncero Workshop and moves to Ibiza; is that the only place it could fit? Yes, I think so. Sublimotion is the evolution of the Workshop of Paco Roncero of the NH Collection Casino of Madrid. 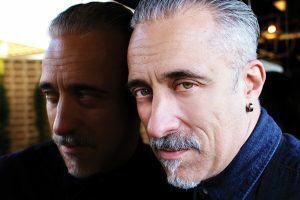 The Workshop of Paco Roncero was born at the Casino of Madrid at a time when I wanted to make a change and look for a customer experience and see in what way we could make that a unique experience. From there we planned to take it out from Madrid and do something more explosive, wilder, and where the emotional and sensory party could be full. We started to think about it and decided that Ibiza may be the perfect place. Ibiza gives you an international projection that does not exist elsewhere. In Ibiza there are people who can afford to pay a dinner with the price that Sublimotion has, which is 1650 euros for diner, and of course, as I said to Abel, Abel Matutes, owner of Hard Rock Hotel where the restaurant is located, there has to be someone like me, a little bit crazy, to invest and make it reality. Can Ibiza turn to the world’s gastronomic centre of reference? I think they are disembarking great chefs with very different concepts and I do not know if it is going to be Ibiza where to focus the world of gastronomy but yes, it is where the most different and powerful culinary concepts focus. So if we continue like this, why not? Will there be more Sublimotions in other places? The truth is that we have had offers from half of the world, especially the Middle East but this is a long distance race and we should go slowly and the most important do is to know what you want, and the first thing is to make excellence here in Ibiza, and then the future will tell. Have you had time to enjoy Ibiza? The truth is that to enjoy the island, I have not enjoyed it yet. I have not had the opportunity. Very little, the truth is that last year I had no time for anything, not to get to know the Ibizan cuisine, although I have eaten some Bullit de Peix. But this year I set a goal to myself to have a little more time, be more relaxed and be able to enjoy a little more of the island, its people and its gastronomy, of course, because last year everything was very fast. What is the breakfast of a ‘super chef’? I try to eat a healthy breakfast because I practice sports and I like to take care of myself. For breakfast I usually have one coffee, some toast with olive oil and tomato, nothing special. It also depends if I trained before or if I am going to train later. For example, on a weekend when I go for a long bike ride of 5 or 6 hours, I will probably take a good oatmeal, a good coffee with milk and some toast to go well energized. Did you eat everything as a child? did not like onions or garlic or peppers, or anything like that. But, in general, I have always eaten well, had no problems. Today the truth is that I have no problem but there are products that cooked, in some way, are not my taste, such as garlic. I can perfectly eat fried garlic but I do not like to eat cooked garlic. I hate to see a piece of whole garlic in a paella and eat it, I like it cut, well browned. A star dish of the Spanish cuisine? There are many, from cooked in any of its versions, the paellas, of course, the stew, the beans in any of its versions, but perhaps the best known star dish is the Spanish tortilla. And the Spanish tortilla, with or without onions? I like with onions, but it depends on one’s taste. Cooking and gastronomy are to be enjoyed, so it is as one likes. If I like with onions I eat it with onions, and if I like without onions, why are you going to take away the pleasure and the luxury of eating a good Spanish tortilla? Madrid stew is one of my favourites that I like most. In fact, I always try to have a good home cooked broth and I enjoy it in winter or summer, anytime. No, I do not cook normally. Firstly, because I do not have time and, secondly, because I do not feel like it. And your friends, do they dare to invite you to a dinner at their homes? It costs them, it costs them, they are afraid. But once I go there, they see that I am a person who likes to eat in a normal way and I also turn off the chip. It is very clear to me where I am and what I want. When I go to a restaurant to discuss what I am eating I turn on the cook chip 100% but when I go to a friend’s house, I will enjoy the company, and the food is not the most important. Certainly if the food is bad, I tell that but without being too picky. Have you ever gone to eat the typical daily menu for 8.50 euros? Yes, it may be the menu or the dish of the day. I have my moments when I like to relax and eat in peace. On Mondays, when the restaurant is closed, sometimes I will eat at a restaurant I know where you can eat very well for nine or ten euros. As a client, have you ever returned a plate to the kitchen? No, I try to eat it all, and analyse it. I do not feel with the ability to derail the work of a whole team. And have you had any dish returned to you? Yes, yes (giggles), as all of us. Did you watch ‘Hands into the dough’? Yes, yes, I watched it from time to time. It was not a program I watched always but sometimes I watched it. Every Spaniard has seen it at some point in their life (he says it while humming the famous theme song of the program issued on TVE between 1984 and 1991). Where do you find ideas to create new dishes? The ideas are born of work, work, and work, and many hours of dedication in the workshop, at your kitchen or wherever. The peaks of inspiration are a very small percentage, the rest is work.